I am planning to move to Berlin but will travel twice per week to Leipzig. For this reason I want to choose an area that has good transport connections to Leipzig. 1) from which stations in or near Berlin can one get an ICE train to/from Leipzig? 2) in general, how would I go about looking up something like this? 1) There are three stops for ICE leaving Berlin in the direction of Leipzig: Berlin Hbf and Berlin Südkreuz. The third one is either Berlin-Spandau or Berlin-Gesundbrunnen. The fifth station in Berlin that is served by ICE trains is Berlin Ostbahnhof, but there are no services from there to Leipzig. You can reach any of the four possible starting points easily by local train, underground or other public transport. 2) Just search for the connection on the web pages of Deutsche Bahn, the main railway service in Germany, bahn.de. You also have the option to generate a list of connections. Essentially there is an hourly ICE connection leaving between 5:00 and 21:00. See http://persoenlicherfahrplan.bahn.de. Edit: Some additional advice: If you travel twice a week you'll quickly be eligible for the frequent traveler status "bahn.comfort". Don't miss out on that - among an occasional free ride it also gives you access to DB Lounges with free drinks in both Berlin and Leipzig. When you enter the name of a city the site knows has several stations, it gives the name in all capital letters as well as in normal capitalization with the names of the different stations. Run the search with the city name in capital letters and you will get all efficient travels in the results, each with the station used for the travel. If you select one station in your departing city, you will still get results, some of which may have the trains you are looking for, but maybe not all of them. And if you selected the 'wrong' station you will often get a short hop to a near station and a change trains. If you use a rail (or general travel) planner which does not allow for an 'all stations' option, just select one station at random, run the search and repeat with a different station till you get a clear picture which station is the best for your journey. For your city pair of Berlin and Leipzig, both cities get the Hauptbahnhof indicated. With for Berlin the addition of 'tief'. Click on Details for this journey and you get more information. If that is not enough for your (it might not be for me) you can either use the map option, zoom in till you get the details for the station you want to know more about, or use the option of more details for the stations, which includes the full address of the stations, one at a time. If you want to start from a different than the indicated station or want to get off at a different one, you can, again in the details, get 'Show intermediate stops' and see which alternative stops this one train stops. I do not see it on this site but many rail planners show 'all trains from this station'. Which will help you with alternative times for the same route. This answer completes Willeke's great suggestion, which I think covers pretty well how to find out which station is the best for you to choose. Since you asked explicitely how to find out which stations you can use, I want to suggest another way, in case the search with capital letters (i.e. BERLIN) doesn't satisfy your needs. This is looking at the list of trains arriving in Leipzig from Berlin and checking which stations they stop at. You can do this using the Webpage (somewhat limited) or the App. Webpage: This service is not available in English and a little more tedious than using the App. 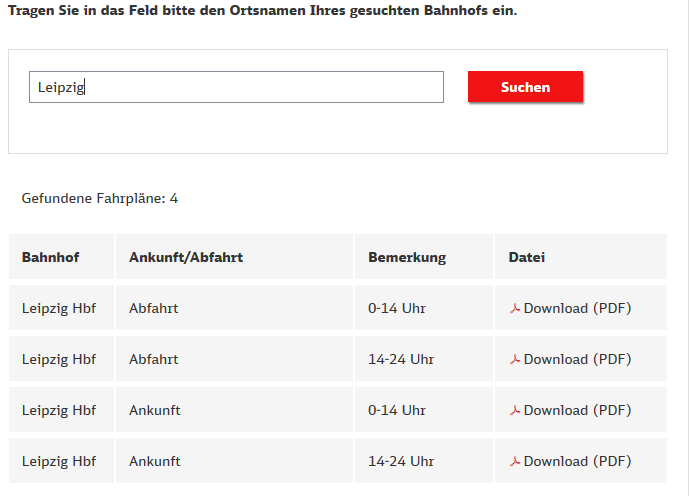 You go to www.bahn.de, click on "Reise & Services" and select "Fahrpläne" (schedules). Then you select "Abfahrts- und Ankunftspläne" (Departure and arrival tables), which will allow you to download the yellow (departure) and white (arrival) timetables that are present in German railway stations. You can also reach this page by typing "Ankunft" in the search field of bahn.de and selecting the first result ("Abfahrts- & Ankunftspläne für Deutschland zum Download"). Now you can type the name of the city your are travelling to and select the correct train station and time table - we want Leipzig Hbf, Ankunft (arrival) and the time you are interested in. Now you can skim through the time table and see where the ICE's arriving in Leipzig stop in Berlin. I do not recommend to use this as the only tool for planning your journey though, especially if do not understand German, since there are many annotations which might be hard to understand - for example "Nur Sa." (saturday only). You can get a similar result more easily in the App. I have it in German, so I am unsure about the correct names, but basically you press on the menu button and select "Abfahrt/Ankunft" (Departure/Arrival). Then you select "Ankunft" (Arrival), type in the station you want to know, the time you want to arrive at your destination, and "Richtung", the direction you are coming from - in this case I would select "BERLIN". Then you can select the modes of Transport ("Verkehrsmittel") you are interested in - here you can exclude everything besides ICE (though it might be worth it to check for IC as well). After clicking "Suchen" (search), you are presented with the next alternative for your query, "Später" (later) gives you other examples. By clicking on it you can see the different stops, among them the ones in Berlin. To clarify, this is pretty tedious. If you only want to know how to get from your location in Berlin to Leipzig as fast as possible, Willeke's answer is the way to go. However, if you want to know where you can jump on the trains to Leipzig, e.g. for deciding where to look for an appartment in Berlin while traveling to Leipzig regularly, these tools might be helpful. Not the answer you're looking for? Browse other questions tagged trains germany berlin leipzig or ask your own question. What do I need to know to go to the Palace of Versailles? Which options do I have to travel in Berlin in an affordable way?